Polycom Pano, a wireless and wired presentation solution, is designed to make it quick and easy for meeting participants to present and share various types of content. 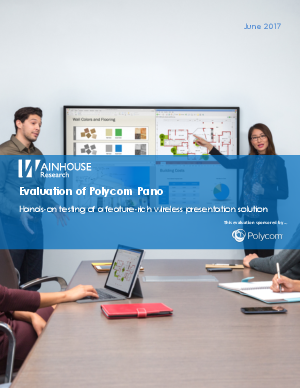 Polycom commissioned the Wainhouse Research test team to perform a third-party assessment of Pano. To facilitate this effort, Polycom provided a pre-release version of the Pano device, and a Sharp PN-L703B 1080p touch-capable 70” display. This report contains the results of our hands-on testing.